New Vs. Used Vs. Remanufactured Cubicles: Which Should You Buy? 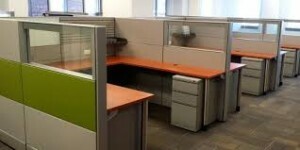 New, used, remanufactured, what’s the difference when buying office cubicles? There is a big difference in price between the three, and also in what the best ways are to utilize each of them in a professional office setting – All of which is included in this informative article. There are several options to be considered when purchasing office cubicles. Some people may not be aware of having a third choice besides just new or used. Remanufactured office cubicles are an economical option, and can offer just as many design options as buying new. Buying used can be a great way to save money on cubicles. But used has its place, and is not appropriate in certain office situations. In order to decide what the best option is for your office, we will take a look at the merits of buying new, used, or remanufactured cubicles, in order to find the best fit for your business. The great thing about buying new office cubicles is that the process is pretty straightforward once you have shopped around for the best office furniture vendor. Many of the details involved in purchasing office cubicles can be filled out on the Merchandisers’ website, even in live chat mode on some sites, so you can conveniently save time, and properly clarify your purchase in order to avoid any costly and inconvenient mistakes on your order. #1. Find out your office needs and the needs of your employees, and then select the right cubicle. #2. Once you know the quantity you will need and the configurations of the cubicles. Then you can perfect your new office layout. #3. Make sure to compliment your new office cubicle’s color scheme with the color theme of your office. Mix and match with color swatches first, so that you won’t be disappointed later if it doesn’t match. – Like power stations, phone outlets, entry point locations, and where you want them all! Used furniture from reputable liquidation houses is going to be the most economical bargain when trying to save some money on office furniture, especially when buying in big discounted lots. Used office cubicles are, of course, always going to be pre-owned, but office furniture stores that specialize in selling used, normally buy from bankruptcy liquidation firms that sell their furniture in good to fair condition. Make sure that when buying used, a high standard is kept up as far as the merchandise that is offered. There are always other purveyors waiting in line with a better product somewhere to make you a much better deal on quality used office cubicles. The perils of buying used office cubicles, though, is that it can defeat the whole purpose of redecorating, or it can also make a new office space look old already. The other bummer about buying used office cubicles is that you are inevitably saving money because of some poor past business’ financial troubles and subsequent liquidation. For most people, it’s just a good deal on used office cubicles. The facts of life are that someone’s loss is usually always someone’s gain in the business world. Recycled furniture helps the environment by creating less manufacturing emissions than new cubicle production. Fewer factory emissions help to control the effects of global warming as well. One of the best aspects of buying remanufactured office cubicles is that it also helps the business community save big money when it comes to upgrading an existing office, or starting a new one. Every business can appreciate saving money on a comparable product. The process takes “Fair” to “Litely Used” cubicles, and then strips them down to their original frames. The factory then replaces all of the parts that need to be repaired, reattach new outer surfaces with modern styles, bringing the cubicles back to a virtually “Like New” condition. The end product is usually much cheaper than buying brand new office cubicles. Most people wouldn’t be able to tell the difference between remanufactured cubicles, and new office cubicles if their lives depended on it. Choosing this option when buying office cubicles also allows the consumer a lot more extra choices in the design process. When pre-ordering large lots of recycled cubicles, one is normally able to custom order their new cubicle designs when buying remanufactured. Many factories in this industry can match, create, and accommodate many different design plans for the client when pre-ordering large lots of cubicles. This makes choosing to buy remanufactured both economical and convenient for the company’s office designer. Office furniture is a serious business purchase that can affect how your office looks and functions for years to come. This is why such a major business decision shouldn’t be taken for granted. New, used, remanufactured, now that your options are clear, you can focus on all of the planning that goes into buying office cubicles. Your office reflects exactly what you stand for; this is why great care should be taken in deciding on the right look. Regardless of whether you choose to buy new, used or remanufactured cubicles for your office, you can take pride in knowing that you did your research and found the best price, style, and representation of how you do business. It is always imperative to make an extensive list of your office needs, styles, and the business statement you would like to convey through your office furniture. Using a checklist is a time-tested and established organizational tool, which ensures that all of your bases are covered first before making a major purchasing decision. Make a needs list: Knowing your needs is paramount to knowing what to buy. This is where an itemized list with specified office needs, furniture use, and exact locations of the pieces to be purchased, become essential office planning tools. Balance your budget: Create reasonable budget goals for each major furniture items, and then do your best to stick to them. Make a concrete spending plan, first listing all of the items that you must have for your business to function properly. You can start that wish list later after you’ve balanced your furniture budget. Research your best price options: Decide where or/if, used and/or refurbished furniture can be tastefully utilized. Recycled office furniture is much cheaper than New, with a surprisingly “Like New” appearance for the money. Make sure to use New or “like New” furniture in high customer or client areas – Utilize shipping discounts – Especially online! Find cautious bargains: Everybody wants a bargain. Sometimes, though, a bargain turns out-to-be not such a bargain. Keep in mind the old adage: “If it sounds too good to be true, it probably is.” Use caution before making major purchases, this prevents having to go through buyer’s remorse later. Know what’s popular: The reason that some office furniture stores are more popular than others is usually due their happy customer base, plus their attention to the latest market trends and styles. Do some office furniture research on the internet first, before you decide to go shopping. Read online store reviews. Find out which stores are the most popular in your area, and why, and then go check them out for yourself. Green with envy? Seeing Red? Wondering if something falls under a – Gray Area? These sayings naturally attribute a color to one’s mood. In reality, the color of an office can affect an employee’s mood, and even how a business’s client base reacts psychologically to an office’s color theme. Marketing companies successfully use color in advertising campaigns in order to convey an emotion or a business/product statement. Your office color theme should also successfully reflect an office’s business statement, work ethics, and efficiency, all at one initial first glance. Blue: Cooling, calming, blue tones effectively tone down a stressful environment. Blue is also most people’s favorite color when asked. Blue is an authoritative color. Greens: An air of reassurance and relaxation are emphasized in natural toned greens. Green is a refreshing color that enhances one’s mood and mental stamina. Dark green instills focus and concentration. Reds: This is the color of fire and action. Red tones in furniture are a great way to psychologically motivate productivity. Red is also an aggressive color, though, so don’t go overboard with red. White: This color, of course, is hygienic and very hospital-like. There are no workplace distractions with white. White can come off as being too cold, though. It can also make people think that your company is unimaginative. Make sure to add a splash of strategic color with a white background. Black: This color is normally used for office warehouse ceilings. But for the business office, lighter colors are usually encouraged in order to brighten up the general mood of the office space. Gray: This color is a very neutral color – The anti-color. Gray can be perceived by many as depressing, dull, and listless, and because of this fact, it should only be used in small amounts, even in office furniture trim. It is best to compare two budgets when deciding between new, used, or refurbished – One budget that only includes the cost of refurbished and used furniture in areas with very little or no client and customer visibility. And one budget that only uses new furniture in its calculations. In this way, you can rationally financially decide whether to go all new office furniture or consider a “Like New” option with refurbished furniture. Refurbished is normally bought in large liquidation lots, and then stripped down to its base components. It is then built back up to “like New” condition by replacing any broken or scuffed parts, and also replacing out-of-style designs with modern ones. Used furniture is, of course, pre-owned, but it is usually sold in large liquidating outfits that sell their merchandise in “Fair” to “Lightly used” condition. Office spaces with rows of classic style office cubicles are a great place to save on refurbished or remanufactured furniture. Recycled furniture outlets, normally allow for custom color and styling options on larger orders. Open space, office areas get a lot of communal worker use and abuse; this is why open space, offices, are also a good place to save on lightly used office furniture. Using floor to ceiling shelving in any nook or open closet, is always a highly recommended way to open up some extra room in a crowded office space. The use of an adjustable standing desk, which can be brought back down to a sitting position when needed, is also an innovative and popular way to work in a small office. Both of these popular office furniture pieces for cramped workspaces can be purchased as refurbished, used, or new, all at a good price in today’s competitive marketplace. Quality, sustainability, and efficiency are the three main key elements that one should be looking for in a piece of dependable and long-lasting office furniture – Whether that piece is new, used, or refurbished is less of a concern than if the piece will tastefully and successfully match your detailed and organized office plan.